I joined Matt & Lisa at Klättercentret tonight for a few hours of climbing. After a somewhat slow start, I began to make some progress. 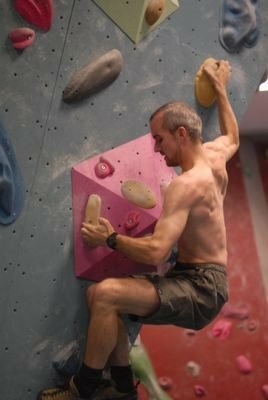 I conquered a bouldering problem that had vexed me last week. This is the first black-rated bouldering problem that I have managed to complete. More photos of tonight's climbing session can be found on my climbing blog, Hit the Rock.